What designer is not a fan of Steve Martino? And this book tells you everything you want to know about the ways to achieve harmony between residence and garden and the landscape beyond. In Desert Gardens of Steve Martino (Monacelli Press, 2018), author Caren Yglesias and photographer Steve Gunther outline Martino's signature designs with brief garden descriptions and beautiful images that show detail after detail, from the vividly colored stucco walls that frame distant views to native plants and elements like an illuminated yellow fiberglass roof, a fence made from rebar, and stunning water features and pools. ... Fabulous present for any designer or dedicated gardener you know. I bet you've never seen the Westside Community Garden, NYC's smallest public garden on 56th St. betweeen 9th & 10th, or the rooftop farm at the Brooklyn Navy Yard. New York is awash in gardens, and while this lovely book, City Green: Public Gardens of New York (Monacelli Press, 2018) by Jane Garmey, includes some well-known gardens like the High Line and Wave Hill, there are many others you'll want to visit. If... and some you've never heard of before. If you frequently or just occasionally go to NYC, you'll definitely want to have a copy of this book. You may think you can't grow palms, but yes, there are some that survive winter temperatures down to zero degrees centigrade, more that survive down to 10 or 15 degrees, and well, the planet is warming. So take a good look at Designing with Palms (Timber Press, 2018) by Jason Dewees, palm expert, designer, and horticulturist at Flora Grubb Gardens in San Francisco. You won't find a better book on the subject. You'll be ready to travel when you pick up Gardenlust: A Botanical Tour of the World’s Best New Gardens (Timber Press, 2018) by British plant expert Christopher Woods, former director and chief designer at Chanticleer Garden in Pennsylvania. You'll know some of these gardens, but there are many fairly new ones that will definitely catch your designer's eye. I love the way this book is organized: a theme tour of important and iconic gardens throughout the world. In The History of Landscape Design in 100 Gardens , (Timber Press, 2018) author Linda Chisholm, who teaches the history of landscape design at the NY Botanical Garden, takes the reader on a tour of gardens from medieval gardens in Europe to the modern gardens of today that emphasize sustainability and native plants. A great book for anyone studying landscape design. My annual post on Paperwhites ... here it is again, for anyone who missed it in the past. It takes four to six weeks or thereabouts for paperwhites to bloom, so get them started for Christmas. Time to get out the Boodle's, Tanqueray, Beefeater or Bombay ... it's not exactly gin & tonic season, but it is the season for paperwhites. And it's the gin that will make them a spectacular show. Plant paperwhite bulbs in stones, gravel or whatever else as usual. Add water, wait until the roots begin to grow, and when the green shoots above the bulb reach 1-2" in height, pour off the water and add an alcohol solution made from gin or almost any other hard liquor, including vodka, tequila, rum, or whiskey. The solution should be one part hard liquor to 7 parts of water. The result: paperwhites that are one-third shorter, but just as fragrant and floriferous as usual. Miller warns against using beer or wine because the sugars in them will cause a lot of problems. The higher the alcohol concentration (within reason), he says, the shorter the plants, but don't use a concentration higher than 10 percent. Rubbing alcohol can also be used to the same effect, but use one part alcohol to 10 or 11 parts water. Miller says he and his researchers are not sure why the alcohol stunts growth, but he says "we feel it is simply 'water stress,' where the alcohol makes it more difficult for the plant to absorb water...enough to reduce leaf and stem growth, but not enough to affect flower size or flower longevity." The Cornell website was passed on to me by my good friend Louise Crane, who saw an article about it in the New York Times. And make sure to order your paperwhites from Brent and Becky's Bulbs ... they have a terrific selection of paperwhites, not to mention the rest of their huge bulb collection. I've been ordering from them for years, and have yet to see better quality from anyone else. For a special person who's a dedicated gardener, I can't think of better way to brighten those winter days than a subscription that will deliver a different plant every month. All the plants in this series are easy care, potted in a five-inch earthenware planter -- and you can choose the color of the planter you want by simply changing preferences on the website. Or ... you could just order this ZZ plant in the small (or larger) HIgh Line Planter, perfect for anyone who's visited the High Line in NYC. It comes already potted, and a layer of porous lava rocks at the bottom ensures proper drainage. The planter comes in other colors as well. Also, check out the Grant Planter, named after Chicago's Grant Park, the Olmsted Planter, and several others. And there are great choices of plants, too. It's the time of year that many of us turn to planning for 2019, and if you're thinking about what shrubs to include in your design, you might want to take a look at Shrubs: Discover the Perfect Plant for Every Place in Your Garden (Timber Press, 2018) by British horticulturist and author Andy McIndoe. I love the way this book is organized: chapters that make it super easy to find what you're looking for, ie, Shrubs for Challenging Conditions such as harsh winters, dry shade, coastal sites, areas with prolonged drought, wet and compacted soils, etc. Shrubs for Restricted Spaces includes chapters on steep slopes & banks, wall shrubs that are alternatives to climbers, narrow beds & borders, small gardens, shrubs for pots & containers. And finally, Shrubs with Desirable Characteristics includes shrubs for hedges and architectural effects, shrubs with fragrant flowers or that attract wildlife, long-bloomers, and more. McIndoe also lists planting partners that go well with each category and includes photos of each plant along with descriptions of notable characteristics. While some of the cultivars he lists may be unfamiliar, you'll surely find similar selections in North American nurseries. It's a book you'll want to ponder carefully while waiting for the first signs of spring. And it would make a great Christmas present for any designer or dedicated gardener. If you live in a zone with moderate enough temperatures into November, you might actually be able to bring in a bloom or two of 'The Pilgrim' for the Thanksgiving table. So, if you haven't got one already, plant one for next year and you'll have the perfect bloom for the centerpiece. 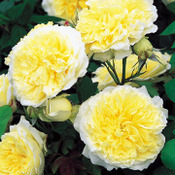 A David Austin rose, 'The Pilgrim' has large, rosette-shaped blooms of a medium yellow color that are paler toward the edges. The scent is a classic tea fragrance, mixed with a bit of myrrh. As an upright shrub rose, it's height is about 4 feet high by 3 feet wide, but it can also be trained as a climber, in which case it'll reach about eight feet high. Sadly, this is the last printed issue of Garden Design... from now on, it's available online only. This last issue focuses on the joy of bulbs ... so plenty of info on color, combos, planting, containers. And ... a wonderful feature on four California designs of LA and plant expert Bernard Trainor with beautiful photos you can study for inspiration. And much more ... savor this last printed issue. *Designer John Greenlee takes a subtle approach to fall color in the California wine country. *Use an arbor as a winter-time focal point when the leaves drop from the vines. This rose is a little hard to find in the US, but well worth a try. It was bred by Alan Meilland in France in 1992, on the 500th anniversary of Columbus' landing in the Americas. The hybrid tea rose Christophe Colomb® Var. Meironsse (or Christopher Columbus) is a shrub about three to four feet high with large blooms of various shades of orange. There is only a slight mild fragrance, but the rose is a vigorous grower that re-blooms throughout the season. If you can track this rose down, it would be a great addition to the fall garden, and it would make a great Columbus Day (October 12th) present. Best in USDA Zones 7b and warmer. It requires spring freeze protection in colder areas. Removing spent blooms encourages re-flowering, and in spring, old canes and deadwood should be removed, and crossing canes should be cut back. In warmer regions, a little more pruning is best. You may think you've seen them all -- Dumbarton Oaks, Sissinghurst, Versailles, Ryoan-ji and many more. But how many of you have visited Junto Farm in the Hudson Valley of NY or Parc Clichy-Batignolles/Martin Luther King in Paris, Orpheus at Boughton House in Northamptonshire, UK or Gardens by the Bay and Parkroyal Hotel in Singapore? You'll be ready to travel when you pick up Gardenlust: A Botanical Tour of the World’s Best New Gardens (Timber Press, 2018) by British plant expert Christopher Woods, former director and chief designer at Chanticleer Garden in Pennsylvania. In the introduction to the books, Woods reports that his aim in this book is "a modern take on ... inherently interesting plants, fresh approaches to how to place them that result in the creation of something new or at least unconstrained by the weight of tradition ..."
He leaves almost nothing out. There are chapters on North, Central, and South America and the Caribbean; Europe; Africa and the Arabian Peninsula; India and Southeast Asia; Asia; Australia and New Zealand. Aside from gorgeous photos, Woods describes each garden in detail and informs the reader who designed it. You'll encounter gardens by some familiar landscape architects like Raymond Jungles, Gustafson Porter, Carrie Preston, Richard Hartlage, Nigel Dunnett and James Hitchmough, and others by designers you've never heard of. And for the gardeners of the world. Every designer, everyone who loves gardens and plants will want a copy of this book. It's the first real comprehensive survey of fabulous 21st century gardens. Jackson & Perkins has just released a new rose in partnership with Four Roses® Kentucky Bourbon to commemorate the brand's 130th anniversary. Of course there's a legend that goes along with it: the brand's founder sent a proposal to a lovely woman, and she replied that if her answer were 'yes,' she'd wear a corsage of roses to an upcoming grand ball. When she arrived with a corsage of four red roses, he named his bourbon "Four Roses" as a symbol of his love. The dark red blooms of this rose have a light damask fragrance, and it's a repeat bloomer if deadheaded promptly. The shrub is 3-4 feet high and wide, heat tolerant and resistant to rust and powdery mildew. Zones 4-10, a good choice for beds, borders, hedges and of course cut flowers. I like to put up rose pictures on holidays ... of namesake roses for the special day. Well, no surprise here ... but maybe you rose growers ought to take notice. There's no such thing, as far as I know, as a 'Labor Day' rose. But there are a lot of what I'd call "workhorse" roses. 'Knockout,' a 2000 All-America Rose Selections Winner, has been around for some time now, but it truly is a workhorse in the garden, blooming from May until frost. And it now comes in a variety of colors, from pale to deep pink, yellow, white, and probably more. If deadheaded regularly, this rose just keeps on coming. Since Knockout's appearance, there are some other "workhouse" roses that certainly merit consideration. The HomeRun rose, introduced by Weeks Roses, now comes in pink (watercolors) and red, and it's another disease-resistant, non-stop bloomer. I have this rose in my own garden, and I love it because it provide color all season long. BUT -- do not deadhead this rose if you want it to keep blooming ... it does best if you leave it alone. Finally, I planted a Drift Rose -- introduced by Conard-Pyle, and it, too, is another workhorse. It's a great groundcover that keeps on coming ... this one is Apricot Drift, but it comes in a wide array of colors, from pale pink to red, as well as peach, coral, and even white. None of these roses are known for fragrance, but who needs scent when you're looking for disease resistance along with steady color.